PayPal employees Max Metral (center), Brandee Shin (left), and Tony Leach are among those now working at International Place. In a Financial District office tower full of buttoned-down bankers and lawyers, the Internet commerce company PayPal is bringing in a workforce more comfortable in hoodies and jeans. The new Boston office for the San Jose, Calif., company spans two floors in 1 International Place, bringing its tech culture, Nerf guns, and foosball table to an address better known as home to investment banking giants such as Morgan Stanley and J.P. Morgan. “Certainly people ask to see your badge a couple of times when you walk into the building,” said Walt Doyle, general manager of the Boston PayPal office. Owned by Internet auction giant eBay Inc., PayPal expanded into Boston when it bought mobile technology start-up Where Inc. for $135 million in 2011. Renamed PayPal Media Network, the Boston operation has since grown to 160 employees. Eric Herot (center), a senior systems administrator, met with colleagues at PayPal’s new Boston office Wednesday. PayPal is also offering free space for a dozen small start-ups at the ­International Place office, which will also serve as the new local outpost for online ticket seller StubHub, a San Francisco company also owned by eBay. 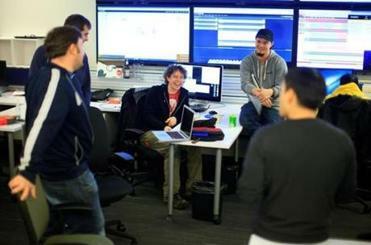 StubHub will have about 50 employees in the Boston office by the end of the year. PayPal’s and StubHub’s ­expansions are part of a string of ­acquisitions of Boston firms by West Coast technology companies. Most recently, the San Francisco social media company Twitter Inc. purchased two Cambridge start-ups — Bluefin Labs and Crashlytics — and will open an office in the area. Seattle’s Amazon.com Inc. paid $775 million last year to buy North Reading robot maker Kiva Systems and has subsequently leased 105,000 square feet in the technology hotbed of Kendall Square. Like others opening in Boston, PayPal and StubHub are planning to use the Boston offices to attract talented computer programmers and software developers coming out of local universities. That proximity to “some of the nation’s best universities” could help StubHub nab “fresh minds” for its office, said Raji Arasu, StubHub’s chief technology officer. The local office will be focused on product development and engineering and is expected to eventually grow beyond 50 employees. PayPal chose the office in the Financial District because it has room to expand, said Dan Gilmartin, director of sales and marketing for PayPal Media Network. In 2010, the law firm Ropes & Gray LLP moved out of the building, opening up about 350,000 square feet. The big floors of the office tower allowed PayPal to create open and cubical-free work and meetings spaces that are commonplace in high-tech firms, he said. “It’s just a cool atmosphere,” he said. But technology companies are also moving to the Financial District and elsewhere in Boston because rents are cheaper than in Kendall Square, the neighborhood around the Massachusetts Institute of Technology that is home to Google Inc. and Microsoft Corp.
Kendall’s popularity among Internet and pharmaceutical companies has driven up rents, and caused some companies to either leave Cambridge or opt for expansion in Boston.